Whether guitar- or viol-shape, renaissance or medieval model, Spielleut or Phoenix hurdy-gurdy - we supply gig bags for all of them! 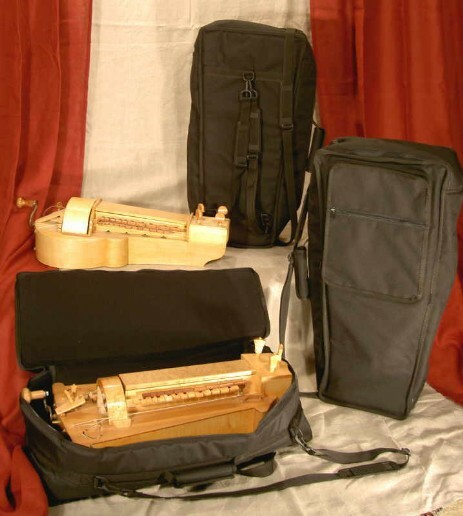 We offer two types of gig bags for flat back hurdy-gurdies: the “universal” and “the block”. Both types are usually in stock - in two sizes each! offers a good protection for numerous hurdy-gurdies. It is padded on all sides and has an additional inlay in top and bottom. 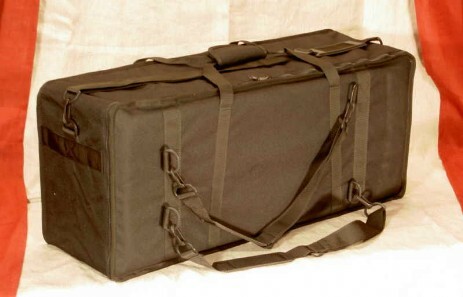 The "Universal" gig-bag protects your instrument and can be stored flat when not in use. 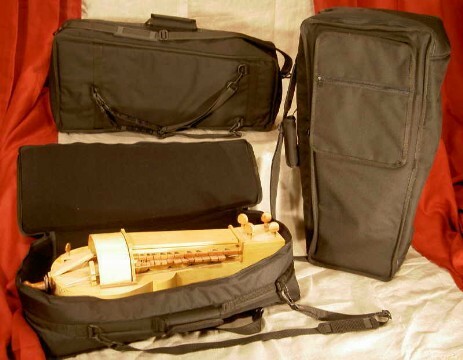 It comes with backpack-straps (used as a backpack the gurdy is placed head down in the bag so there won´t be any pressure on the crank), a shoulder strap, handle and an extra pocket for sheet music and accessories like rosin, cotton etc. 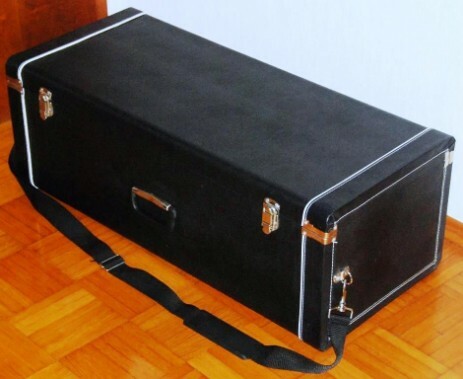 is it a gig bag or a case? 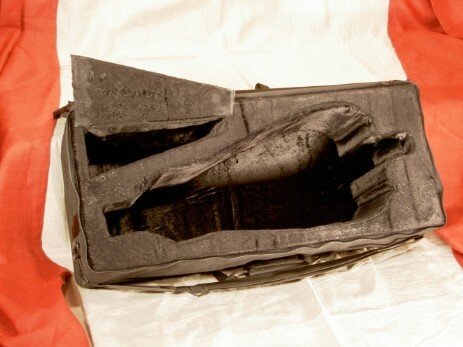 With less than 3kgs (standard size) it´s at least less heavy than any solid case. The concept is simple: We take a solid block of polystyren, make a cut-out for sheet music, accessories etc. 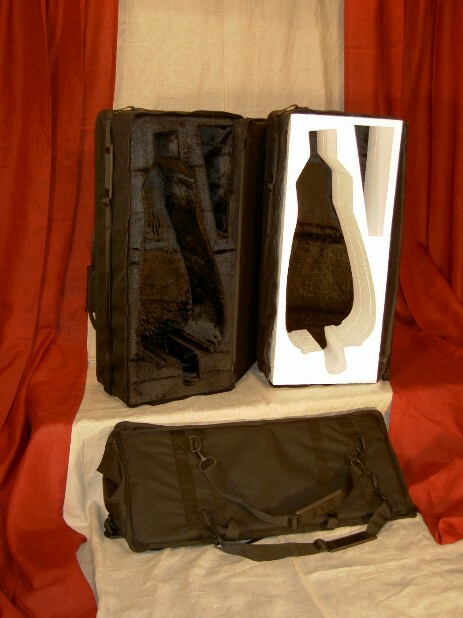 and, of course, the exact form of your hurdy-gurdy, pad it with upholstery foam, cover it with fabric and here it is: The very special gig bag customized for your hurdy-gurdy! As a sample we´ve prepared “the block” for a Phoenix by Helmut Gotschy. You can see the empty bag in the front, the “raw” polystyren block and the bag as it will be delivered. The polystyren block protects your instrument from all sides, the top and bottom are strengthened by additional inlays. The pocket for the accessories has a seperate top (see pictures on the bottom of this page). ”The block” comes with backpack straps, a shoulder strap and a handle. And it is light: less than 3kgs for the standard model all in all! The bottom of your hurdy-gurdy is not completely flat? No problem! Each "Block" case is customized - it'll be “your block”. If the back of your hurdy-gurdy is slightly curved just add one more line to your drawing we need to produce "your block". And there's one more extra available: you can have the base plate in 3mm timber (MDF) instead of card board (2mm standard) - more stability, but also a bit more weight. These gig-bags are made especially for your instrument - but without the need to send your instrument around. All we need is a simple drawing of your instrument according to our instructions. We´ve prepared those as a PDF-File, so just click on the link below and download the file. To read the instructions you need the acrobat reader, a program which should be installed on most machines. You can download it for free from www.adobe.com. "The Block" is now also available for hudy-gurdies with slightly curved back. For details see the instructions you can download below. The “Block” is now also available in a wooden hard case for better protection. This case comes with handle and shoulder strap. The instructions are the same as for the block bag. To download please click here or here. For hurdy-gurdies like “Vivace” or “Largo” by Hilsmann or “Phoenix” and “Largo” by Gotschy/Betz there’s no need to send us a drawing - an order is sufficent!